POSCO, in investor relations materials released in early January at an IR session in New York, said it plans to produce 36 million tons of crude steel this year with 34 million tons of steel products produced and sold. To hit the production targets, the steelmaker plans to fully use the 4th blast furnace and its Gwangyang steel complex at full capacity. The company will also strengthen its marketing to the extent that it will be a dominant steelmaker in the world with tailor-made services for each of its customers and it will lock in long-term customers for high value-added profit. POSCO will expand its number of steel assembly centers ― three in India and three in China ― to strengthen its global marketing infrastructure. The steelmaker will also endeavor to bring down production costs by employing top steelmaking technologies through continuous investment in R&D activities to the extent that the ratio of R&D investment would be 1.72 percent of its total sales. The company said it will produce the world’s best and world’s first steel products and market them expansively, while focusing on the development of new strategic steel production processes. The steelmaker will also find where it can cut costs and improve production processes in order to lower production costs by 800 billion won this year. The company has plans to relocate the steel assembly plants in emerging markets overseas to be more competitive. In Indonesia, the steelmaker will build an integrated steel mill; in Brazil it will build a customer service plant; and a SAIL joint venture agreement has been signed in India. In addition, the steelmaker will build a cold coil steel plant in India and in Turkey a stainless steel sheet plant capable of turning out 200,000 tons annually will be built starting from this year. The projected steel mill in Indonesia, POSCO’s first integrated steel mill overseas, will be capable of producing 3 million tons of steel when the first stage is completed and it will be expanded to 6 million tons in 2013. The company will also begin the construction of a continuous galvanizing line capable of producing 450,000 tons of galvanizing steel per year in China, while a cold roll steel plant capable of turning out 1.8 million tons of the steel product will also be built in India. The capacity of the stainless steel sheet plant in Vietnam will be expanded to 240,000 tons from the current 90,000 tons in 2012, while POSCO-South Asia Inc. will be set up to take charge of marketing in Southeast Asia. In all, global steel processing plants will be expanded to 48 from 42 in the near future. At home, the company will expand its production plant capacity for steel plates by 2 million tons per year at its Gwangyang steel complex and four blast furnaces will be repaired and improved to expand its capacities to 5,600 cubic meters from 3,795 cubic meters this year at the Pohang steel complex. The company will also expand its own supply of raw materials to 50 percent of total needs by 2014. The company holds a 3.75 percent stake in the Roy Hill Iron Ore Mine, a 24.5 percent stake in API and a 70 percent stake in the Hume Coal Mine, all in Australia, and 7.8 percent stake in Mozambique. The steelmaker will build an integrated steel plant in Congo, its third steel production plant outside of Korea, following one in India and another in Indonesia. POSCO has decided to secure the rights for 150 million tons of iron ore annually in the African country. Reports said Chairman Chung Joon-yang and Vice Chairman Lee Dong-hee of Daewoo International were supposed to call on Congolese President Joseph Cavilla and sign a confidential agreement, which is stronger than an MOU. The agreement would provide for POSCO’s securing the rights to mine 15 million tons of iron ore and 1 million tons of copper annually in the mines located in the Kashumbalesa region, some 80 km south of Lubumba City, with work on a steel plant in the region beginning early next year. Local sources said the Congolese government requested POSCO to build the steel plant. The company will build the steel plant based on the Green Field Investment method, which means that POSCO will buy the land to build its steel plant and secure an adequate supply of iron ore before deciding to build a steel plant. The steelmaker has been working on a project to build an integrated steel mill capable of turning out 12 million tons of steel per year in Orissa State in India using the same method since 2005. 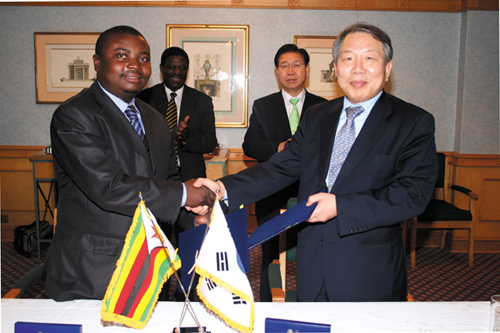 Vice President Kwon Young-tae of POSCO in charge of raw materials shakes hands with President Nyabadza of Anchor Holding Co. after signing an MOU to build a joint-venture mining company in Zimbabwe. . Watching in the background are Chairman Chung Joon-yang of POSCO and an official of Anchor Holding Co.